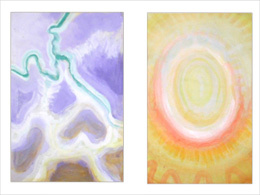 Abstract painting techniques can be a great way to experience the flow of the creative process itself. For that, it's best not to look at official abstract art, unless you're short of ideas. Just try things out on your canvas, and have fun doing that. When you're a beginner it's good to limit yourself to either light and darkness (black and white paint), or only working with colors. Here you'll find a list of colors that give good color mixing results. Keep your painting composition as simple as possible. Keep your colors as simple as possible. Start with two or three colors, explore their possibilities to their full extent, only add other colors if the painting needs it. Work from big to small: first fill the whole canvas with a background. Try out different gestures: 'feel' what they mean, and use these qualities. Also 'feel' your way into different area's of your painting, and relate them to the way you feel your own body (it helps, when you work standing up). If you want your painting to have 'body': don't cling too much to your first strokes. Paint like a construction worker, when you do a first layer, and paint over that without pain in your heart. But when the painting has 'body', or you like a thin and ethereal look: hardly no effort can improve on the purity of the first stroke. When you paint, you always refer to something. If it isn't to the outside world, it is to your own body, or mood, something you know, or the idea you have in mind while you paint. My experience is: when you paint without having any subject in mind, you create a depiction of yourself, or the way you are or feel at that moment. Sometimes even organs like the heart or the kidneys can be pointed out on a painting like that. This body-thing is important, because in abstract painting techniques, you actually work with the thinking capacity of your body. Just likt graffity-painters and dancers do. And: when you conciously relate to your painting with your body, you will enable your onlookers to do the same, and feel their way into your painting. When you let go of the outer appearance of things, delivered by the eyes, the body is the first thing you have in common with your onlookers. We are humans, and for a painting to be beautiful or meaningful to us, it has to have some relation to what we are. Not all abstract painters are formal; Mark Rothko, an abstract colorfield painter, declared that he was in no way interested in form or the relation between form or color. He said, all he was interested in, was depicting basic human emotions like fear, love, exaltation and such. Some painters think that abstract painting techniques need to be disharmonic - but it doesn't have to be that way. A painting can affect you in two different ways - one way is: luring you in with beauty, offering a space or a scene that you're free to respond to - or not. 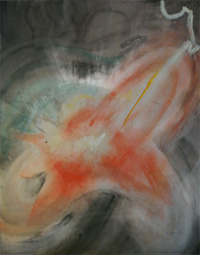 The painting doesn't do anything directly: it waits, untill you are ready to open your soul, and allow the experience. The other way to make an artwork impressive is by force - by presenting effects that are ugly, disharmonic or painful to look at. Uglyness is often a necessary ingredient for a good artwork. Some artworks however are disharmonic or painful to look at, without offering any kind of solace or transformation. Some people actually find this kind of art really beautiful or important. And others wonder how an artist could possibly do that stuff. This is not about making judgments. It's necessary to deal with things that are cruel, not nice, or ugly. I like artworks that show a way of dealing with these facts of life. Like reality, art can't only be beautiful. It can't be only ugly either. What matters is, if it generates some meaning - which is something beyond ugly or beautiful. When doing abstract painting techniques, you work with all the elements that you use in realistic painting. You use form, color, some navigation in space, proportions, composition. The difference with realism is: you go to the inside of things, instead of the outside. However, there's a sidetrack or parallel universum you can loose yourself into: the mathematic world of form or color, where all forms and qualities are abstract, and equally interesting and valuable. Kandinsky had a certain incling to that. You can prevent yourself from getting lost, by choosing a subject, define its meaning, and stick to it. 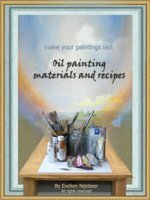 Try the pages on landscape painting techniques, or portrait painting techniques, and see what you can do with this knowledge. Do look at the brushing page as well. In this ebook, "A walk into Abstracts", there are over fifty artists, showing more than 100 paintings, and every artist tells you about how and why they made their work. This can be a great help in developing your own abstract painting style - reading about how 50 artists developed their style just creates a great reference and navigation field for your own decisions in this part. Highly recommendable, especially when you didn't get the chance to visit art school. A mood or feeling, preferrably linked to memorizing a concrete event. What did your anger look like? Contrasting qualities: hard-soft, big-small, simple-complicated, light-heavy etc. A person - what is he or she like, when you think away the face? Paint him/her in colors and form. You'll be surprised. Abstract painting techniques are pretty new in art history. Before world war 2, they were still referred to as 'gegenstandslos', meaning "immaterial" or "without objects". At that time, the goal of abstract painting was explicitly spiritual, done with the aim of exploring new worlds of experience. After WW2, abstract painting went more formal (as the spiritual went temporarily out of fashion). There's a big difference between old abstract painters like Mondrian or Kandinsky, and contemporary ones. The old ones had an old-fashioned training in realistic oil painting techniques. In that, they learned about natural proportions and color. They took this knowledge into their abstract work, which gives it its actual quality. Check here for more abstract painting ideas to be found in art history. Very noticeable: once abstract painting techniques were discovered, dozens of "isms" arose in painting: expressionism, cubism, fauvism etc. Most of them were still halfway realistic, or had realistic elements in them. The "ism" on the end of those names indicate, that these ways of painting were actually meant as a form of philosophy or thinking, a way to look at things. After ww2 abstract art became really abstract (without realistic elements), and there were 'isms' with names like Color field painting, Abstract-expressionism, Lyrical abstraction and Minimal art. Some of this art is very formal - objective, but not human. Still it's good people did these things. When you leave out the colors, the form of a landscape or person still points to this reality. With color it works about the same: if you pick colors out of a forest, painting them totally abstract and random, you will still 'feel' the forest. When you do that three months later, you even see the two different seasons of the forest (one of my art teachers did that). 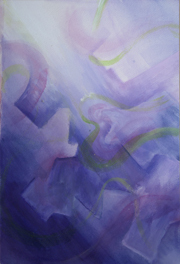 When you make 'abstract' form, form and gesture will start to communicate feelings or moods, rather than objects. Depth can be created in different ways: one is, to have sharp and blotchy parts. The blotchy, unsharp parts to to the back. When you make your strokes go smaller towards a certain point, it will function as a perspective point. 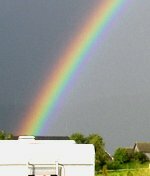 Colors have an effect too: in a cold setting, warm colors wil pop forward, on a warm colored background, cold colors will come forward. It works the same with contrasting colors. When you stand in front of a painting, you relate to it as to another body - and you compare it to your own. You can work with that. Light is equal to consciousness, it makes you see things. We're most conscious in the head (and hopefully a bit in the heart too). In our limbs and bowels, we relate to darkness or matter, which is more in the lower part of the painting. These are interesting things to work with. It's great fun to paint things that don't have an outside appearance yet, and to freely explore what they might look like. Do you take oil or acrylics for abstract painting techniques? 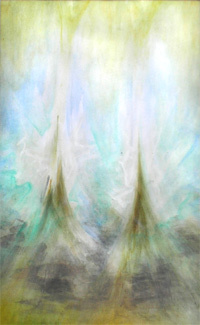 Both oil- and acrylic painting techniques are suitable to go abstract. Using oldfashioned imprimature and underpainting techniques might give some natural basis to your abstract painting. But acrylic paint dries a lot quicker than oil paint. And you can do underpainting techniques in acrylics as well. Just make sure you get paint with good pigments (of a decent brand), when you buy acrylic paint. Cheap acrylic paints with chemical pigments can look hopelessly artificial. As an answer to that, Golden created a new line of colors (golden historic), of which I especially recommend the Alizarine Crimson (all other carmines are too light). Check out Blick Art Materials for these products. If you want to give the emphasis to color, consider painting with matte paint. Lean oil paint is matte (or oil paint with a drop of water ground into it). Further, you might want to try egg-tempera or caseine-tempera painting - they give matte, velvety colors.